Victims of domestic abuse face a wide variety of barriers to achieving safety, and staying safe after they leave a batterer. At SAAV, our primary goal is to remove one of those barriers to safety by providing temporary, confidential refuge for beloved pets so that victims can leave a batterer without fearing for the safety or well-being of their animals. At the end of the shelter period, victims and their pets are reunited in tearful, joyous, wonderful reunions. SAAV returns each animal to their person with a “FurEver Together” gift basket. Our baskets are designed to relieve some of the burden of caring for pets while victims continue the transition to safety. 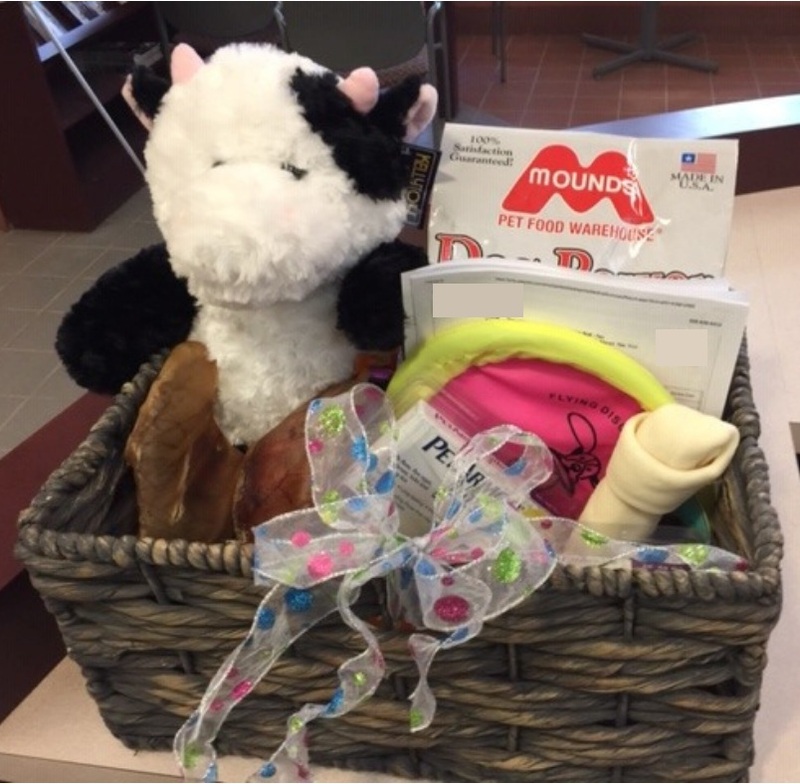 The FurEver Together basket includes: pet food, three months of flea and tick prevention, three months of heart worm medicine, toys, treats, other care items, and a card from SAAV to send them on their journey with love. Our goal is to keep these dual survivors of abuse TOGETHER after they are reunited with one another following our shelter period. Having a safe place for animals, and help with their care following reunion, provides immense comfort to victims. SAAV is thrilled to report that the October 5th Cycle of Abuse conference was a sold-out success! Focusing on the link between family violence and animal cruelty, speakers addressed the underlying issues like power and control that connect these abuses as well as the practical steps that we can take to help vulnerable people and animals in our communities. The day was bookended by two speakers that highlighted how the connected issues of animal cruelty and family violence touch so many lives and bring together a wide range of professionals and practitioners dedicated to ending the cycle of abuse. Dane County Sheriff David Mahoney opened the conference with a rousing call to action, describing the progress Dane County law enforcement has made in their efforts to support victims and address these crimes and reminding us of all that is still to be done to end the cycle of abuse. In a fitting end to a day of panels about the bonds between humans and animals, keynote speaker Dr. Patricia McConnell made the connection between how humans and dogs experience trauma, bringing in examples from her own life and her own beloved dogs. After Dr. McConnell read excerpts from her book The Education of Will, there wasn’t a dry eye in the house! The conference was deeply inspiring, as everyone there was committed to understanding and addressing the cycle of abuse that harms both humans and their beloved animals. Lawyers, humane officers, social workers, educators, veterinarians, veterinary technicians, police officers, domestic abuse advocates and animal advocates were at the podium and in the audience, discussing the links between family violence and animal cruelty and what we can do to address these issues. Animal cruelty and family violence present many challenges across each of our professions and communities, so we all might face them in different forms. But what conference speakers emphasized is something that we truly take to heart at SAAV: we can help humans and animals best when we work together and talk to each other. Ending animal cruelty and family violence is a vital goal for SAAV, but it’s not something we can accomplish alone. We need all hands on deck! That’s why we are so grateful to our sponsors, volunteers, speakers, and participants who made the Cycle of Abuse conference such a success, and who helped to shed light on the links between animal cruelty and family violence. Thank you! The former student charged with killing 17 people at Marjory Stoneman Douglas High School in Florida wrote on social media that “toads tended to run away when they saw him” because he had “killed a lot of them.” An anonymous caller to the F.B.I. warning about the threat he posed specifically mentioned the “photos of sliced up animals” the perpetrator posted. Neighbors remember “watching him try his best to use a pellet gun to kill a squirrel,” “shooting at chickens,” and wielding a stick as a weapon towards rabbit burrows, “trying to ram it down as hard as he could to kill any bunnies inside.” Several neighbors also remember him encouraging his dogs to attack a neighbor’s pet potbelly pigs. A history of domestic violence is also common among those who commit a mass shooting, leading many to argue that we need to “examine the patterns of violence” that are driving these tragic incidents. The perpetrator of the Parkland school shooting allegedly behaved abusively towards an ex-girlfriend and was expelled for fighting with that ex-girlfriend’s new boyfriend. The perpetrator of the Sutherland Springs mass shooting served time for assaulting his wife and stepson. The perpetrator of the Pulse Nightclub shooting reportedly had a history of domestic abuse. One recent study found that perpetrators of domestic violence accounted for 54% of mass shootings between 2009 and 2016. According to the FBI, at least 57% of the mass shootings (involving more than four victims) between January 2009 and June 2014 involved a perpetrator killing an intimate partner or other family member. How can we break this cycle of violence? Those most closely affected by school shootings emphasize helping students and other young people get the help they need, as part of their advocating for gun control legislation and mental health resources. In a recent listening session at the White House, parents of children killed during the Sandy Hook school shooting advocated for “prevention programs that train schools and educators to identify students in crisis and intervene before they attempt to harm themselves or others,” like those provided by the Sandy Hook Promise organization that teach young people to “recognize warning signs and signals, especially within social media” and to tell adults if they are concerned. Like so many women, domestic violence has touched my life; statistics show that one in four women will be a victim in her lifetime. I’ve always been a strong advocate and supporter of victims’ rights, and in my search for ways to do as much as I could to help end the cycle of domestic abuse, I discovered one of the most phenomenal programs I’ve ever seen in helping victims remove one more barrier to leaving their abusers. I’ve been a Foster Mom for Sheltering Animals of Abuse Victims ("SAAV") since 2010, and it’s one of the most fulfilling and rewarding experiences I’ve ever had. Anyone who has ever had the loyalty and love of an animal understands how strong the bond is between pet and owner. It’s not surprising that a huge percentage of victims are afraid to leave their abusive partners (and often don’t) simply because they can’t leave their pets behind. But, as a Foster Mom for SAAV, I’ll never get to meet the owners of my foster “fur kids.” To keep everyone safe, we all adhere to a strict code of confidentiality, which means clients of Domestic Abuse Intervention Services (DAIS) who use SAAV’s shelter services for pets have no choice but to trust that sending their pets off to live with a stranger is safer than leaving them behind with an abuser. But, if I could talk to these victims, I’d hold their hands and promise I’ll take excellent care of their fur babies. I’ll bring their scared, confused, and lonely animals into my home and shower them with love, comfort and attention. I take our foster dogs for walks, and throw balls in the back yard. I convince shy foster cats out from behind couches and under beds with tuna and quiet coaxing. Everyone is allowed on the bed for belly rubs and ear scratches. Every foster leaves our home a little bit heavier thanks to extra treats tucked in their food dishes. I take pictures of every foster case we’ve had, and hang them on a bulletin board in our hallway so I’ll never forget the wonderful energy they brought into our home. The only connection I have with these animals’ owners are the occasional updates and photos I send through my contact at SAAV or the Dane County Humane Society (DCHS) … who passes it along to the appropriate DAIS case worker … who shares it with the client using DAIS services. There’s a reason people become volunteer foster families for SAAV – we have a crazy amount of love for animals, and we’re equally dedicated to helping victims take the steps they need to build a new and better life for themselves and their families. Domestic violence impacts the entire family … pets included. SAAV has built an amazing model in providing vital support to victims, and I’m proud to be involved. In 2009 I attended the Animal Law Conference at Lewis and Clark Law School. One of the talks I most enjoyed was given by Sheltering Animals of Abuse Victims (“SAAV”) co-founder, Megan Senatori. I’d never before considered the link between animal cruelty and domestic violence. I was impressed that Megan had helped co-found a foster network to provide safe shelter for the pets of survivors fleeing their abusers. Three years later, as I attended a luncheon to benefit my community’s domestic violence shelter, I wondered if our local domestic abuse shelter, Middle Way House, offered refuge to the pets of survivors escaping violent families. Bloomington, Indiana is a forward-thinking college town; I felt sure that the idea could gain traction if a program was not already in place. I was aware that SAAV was a resource available to help others interested in starting shelter programs for the animals of abuse victims, so I sent Megan an email to touch base. Then, a friend put me in contact with a Women’s Advocate at Middle Way House named Erin Biebuyck. I learned from Erin that Middle Way occasionally received calls on the crisis line involving animals, and that they provided help as much as possible on an ad hoc basis. In a cool ‘Great Minds Think Alike’ moment, it turned out that Erin had already been considering the idea of working to pioneer an official safe haven for pets program. The second coincidence was that Erin had contacted a group in Wisconsin called SAAV just the week before! Erin and I laughed when Megan put us in touch with one another. The stars were aligned and we got to work. Erin and I formed a planning committee with several other terrific individuals: Jo Liska, Debra Morrow and Stacy Weida. Megan Reece joined the team as a volunteer intern. We hammered out the policies and legal issues of our program. We crafted administrative forms, wrote proposals for grant funding, sent letters to request product donations, planned a Crowdfunding campaign, trained program volunteers and gathered community support. Ten months after our first committee meeting, we officially launched Middle Way PAWSS (Providing Animals and Women with Safe Shelter) in September.